This well detailed kit includes the ZIL tractor, the transport trailer .and the launch ramp . A driver is included behind the wheel of the truck but it is a pity no launch crew was included. It seems possible to pivot the transport rail to a resplenishing configuration. 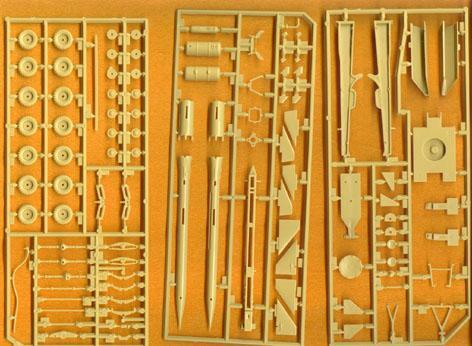 This tooling for this kit was apperemently lost when it was shipped to Tsukuda. Parts for the kit . Wisely the missile itself is on separate tool . 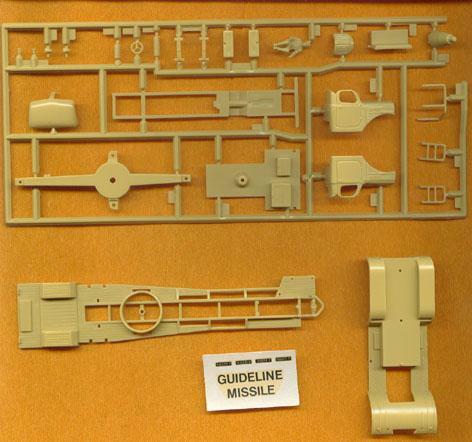 The decal sheet is minimal and do not include the numerous stencilled markings appearing on the real missile. A curious illustration from the 10th edition of the catalogue . Did it ever appeared on a boxtop ? Illustration of a built-up model in the 14th edition catalogue .